From 5G NR to 5G CN. The most comprehensive and updated course on 5G. Self-Paced. 5 modules, 2-3hours each. Emil Olbrich is currently President at PrimeLime, Trainer at 5G-Courses.com and also VP of Networks with Signals Research Group. Prior to this he was head of LTE research, development, test and evaluation for the Public Safety Communications Research Program where he deployed the first and most diverse Public Safety 700 MHz LTE test lab in the world with over 70 participating vendors and commercial carriers. He was responsible for the specifying, deploying and maintaining the entire ecosystem of LTE which included devices, air interface, transport, radio access network, evolved packet core, IP networking, IMS core and application servers. He also led the team efforts, which include standards work, test case development and test case execution. Mr. Olbrich has over 20 years of experience in the field of wireless telecommunications. He has worked primarily in R&D at some of the largest telecommunication companies in the world – such as Motorola, Qualcomm and Ericsson. His scope of work includes deploying and operating LTE infrastructure (RAN, EPC and IMS) from numerous Tier 1 vendors; testing new LTE mobile devices from multiple suppliers; testing, deploying and operating some of the first commercial CDMA networks; serving as Lead Project engineer for the 2002 Salt Lake City Winter Olympics and as the Project Manager for the China Ministry of Information Industry 3G testing in China; and supporting the early development of HDR (EV-DO and EV-DO Rev A). 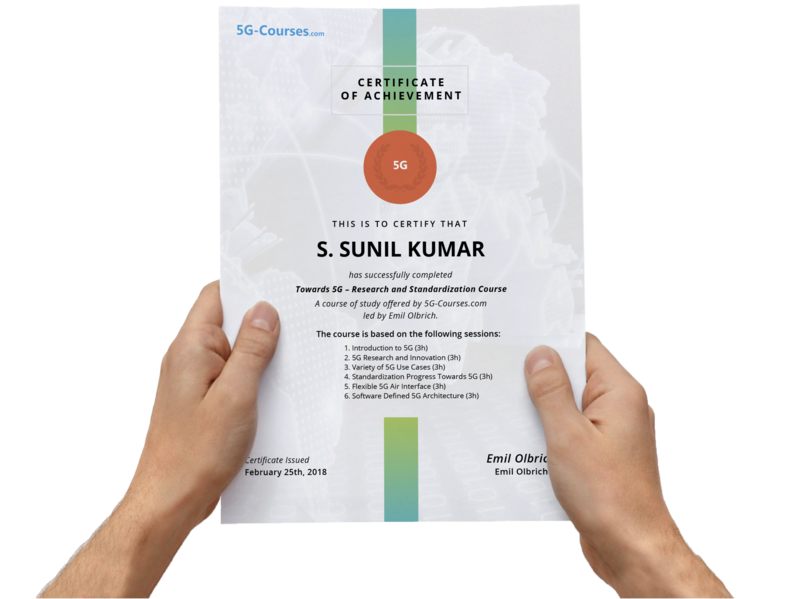 Get recognised for your knowledge when you earn an official certificate of competence from 5G-Courses.com – the world's leading home of 5G Education. Certificates are issued in your legal name upon successful completion of the course, as per stipulated programme requirements. The visual representation of the certificate here serves as an exemplar, and may be subject to change at the discretion of the 5G-Courses.com. Thanks to the trainer for wonderful explanation, understanding the foundation of 5G network and learning towards realization of 5G network. I found this course with a huge amount of information by 5G radio and core network side. Every concept is well structured and deeply handled. moreover it provides a lot of clarification about this new standard from requirements to engineering point of view. The best choice to start with 5G. Best 5G course to take. Though lot of comparison with the Legacy LTE, the instructor has very deep understanding of both 4G and 5G makes this course special. Thank you for teaching me 5G. The best 5G training course available nowadays!!! Great trainer, Great course, Great quality! The course presented by trainer Emil Olbrich provides a huge amount of knowledge for 5G research and standardization in a very understandable way. Perfectly structured and organized slides with the high quality of explanations. This course put us into deep dive to 5G technology and provide deep understanding from Radio part (NR) to next-generation core (NGC). Fantastic explanation of use cases, NR, RAN, Core architecture and interoperability between 4G(LTE/LTE-A/LTE-APro) and 5G. Highly recommend this course!!! Great job in covering all technical aspects of the 5G world and how the standardization is and will shape the future. Register Now and Save. Our Regular price for this course is $1295. Is the tuition cost all-inclusive? Yes! It is a one-time payment, and covers all program features and benefits. Are there any group discounts available? What are the prerequisites for enrollment? You should be familiar with wireless technologies in general and ideally with LTE. Are there scholarships available for this program? Not yet, but we are working on this. Please email us to [email protected] to learn more. There is no refund option possible since once you get access to the learning platform you get access to the whole course and all the materials. When does this course start / end?